A dozen or so years ago, the power bead bracelet burst onto the scene. Trendy teens and tweens loaded up their arms with “healing crystals” that claimed to rejuvenate the mind, repel negative energy, and even attract luck. Today, the power bead bracelet is all grown up. Many top jewelry designers have incorporated power bead bracelets into their collections, and, what was once solely the province of the under 16 crowd is now completely mainstream. 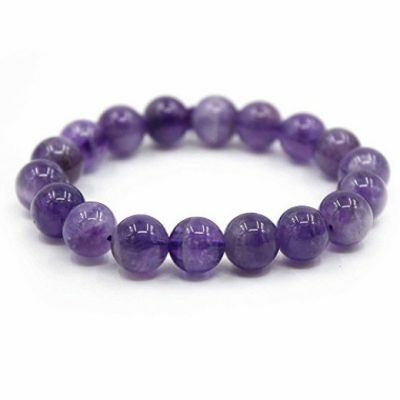 For example Nialaya offers a beautiful amethyst, rose quartz and cherry quartz beaded bracelet ($370). John Hardy’s Batu Classic in turquoise is a stunner ($395). And, even David Yurman has Two-Row Power Bead Bracelet with black onyx and tiger’s eye ($450). Luckily, you don’t have to spend a fortune to get the look. The gorgeous KISSPAT beaded bracelet, pictured, is crafted of highly polished, genuine amethyst. The 10 mm stones are beautifully matched in color and are strung on comfortable, stretchy elastic. This bracelet looks lovely on its own, or paired with other pieces. I like it in combination with a David Yurman-inspired cable bracelet, a simple bangle or two, or even a coordinating sterling Trollbeads charm bracelet. And, at a Retail Price of $20.00 and an Amazon Prime Sale Price of only $7.66 you can take a page from the teens and tweens of the early 2000s and load up with a variety of colors. KISSPAT has so many choices — from sweet rose quartz, to elegant lapis lazuli, to brilliant green aventurine, plus many more. Although this power bead bracelet may not actually have the power to rejuvenate the mind or repel negative energy, I do feel pretty lucky to have found such a bargain! Love trendy jewelry like KISSPAT’s Power Bead Bracelet? 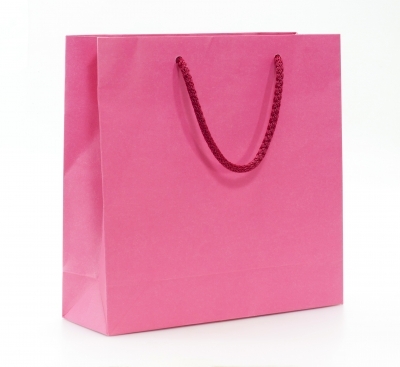 While you’re here, please take some time to enter one of our jewelry giveaways! DISCLAIMER: No financial compensation was received in exchange for this Power Bead Bracelet post. 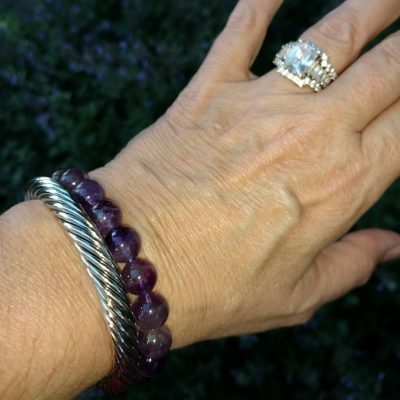 I did, however, receive a sample of the amethyst bracelet, shown, in order to fully test the product and provide an honest review. Regardless, I only recommend products or services that I believe will be good for my readers.